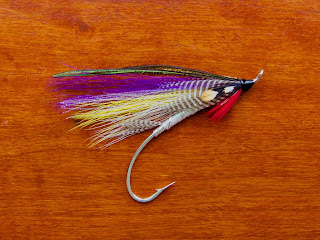 With most of my fly tying orders completed, I'm beginning to focus on tying for a June trip to two of Quebec's finest salmon rivers, the Bonaventure and the Grand Cascapedia. My first Atlantic salmon fishing experiences were on New Brunswick's Miramichi River. Years later, my fly box still leans heavily towards Miramichi patterns. At one time, I was inclined to fish these flies in any salmon river. They have worked most places I have fished them. Despite my success with Miramichi flies, I began to feel like I was missing out on the overall experience by not devoting more time to tying patterns that are more often used in other parts of the Atlantic salmon's range. 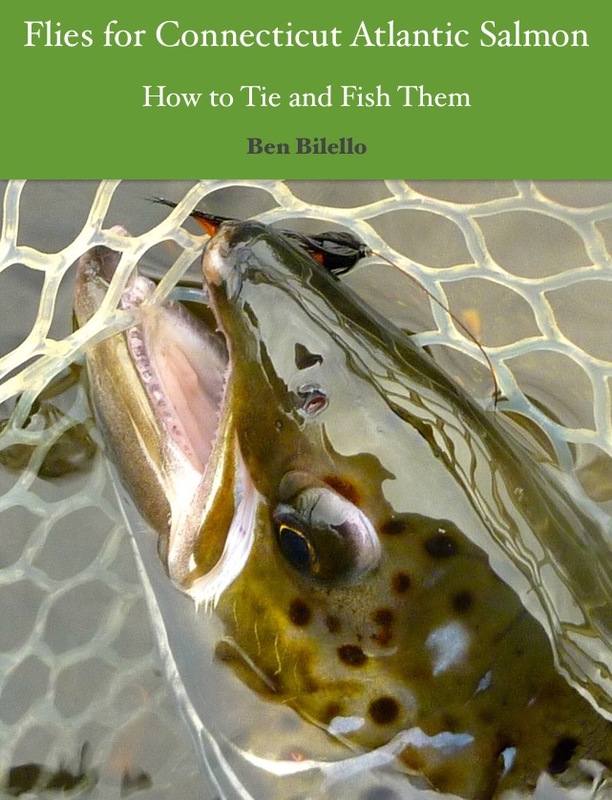 For this trip, I decided to tie a number of patterns that are commonly used in the Bonaventure and Grand Cascapedia. I was most excited to tie flies used for fishing in high water. A lack of snow will probably result in lower-than-normal rivers for the time of year I will be fishing, so I anticipate using mainly smaller flies. Snow or no snow, rain can happen at any time. Instead of being caught with my pants down and not having enough high water flies, I decided to tie them anyway, even if I don't use them. 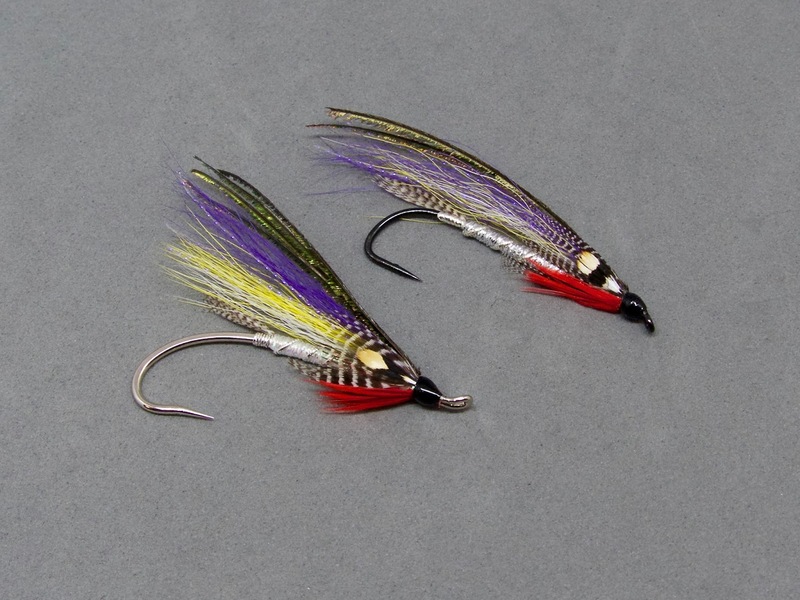 I have been told that Magog Smelt is a popular high water fly on many Quebec Rivers. I am very familiar with this classic bucktail, having fished it for trout on many occasions, though I have never fished it for salmon. I have confidence in the pattern, so I wouldn't hesitate to try it under the right conditions. My most memorable experience with the Magog Smelt was during an early spring trout fishing trip to Vermont in 2010. My friend Bobby was my guide and we were fishing an area not known to harbor many brown trout. Unlike many surrounding waters, the fish in this particular stretch of river are not stocked. Bobby stressed that we after quality, not quantity. Most of the river's inhabitants are wild rainbow trout, with a few native brook trout scattered about. Though we didn't find any monsters, we caught several fiesty rainbows and brookies in a few different streams. 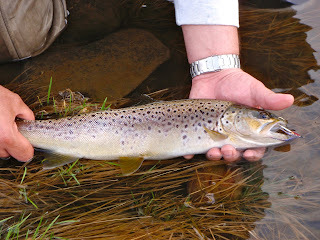 Brown trout are not often seen in the rivers we fished. After fishing a fast run in a large river, we moved to a slower stretch of water upstream. It wan't long before I felt something slam my bucktail. The fish was a strong fighter, but was eventually brought to hand. Bobby was shocked to see a brown trout. I was just happy to have caught a nice fish. Shortly thereafter, I landed a nice rainbow trout on the same fly. I'm not sure why I never bothered trying one for Atlantic salmon. I had a few in my salmon fly box for several years. They had been gathering dust, so I made a place for them alongside my trout streamers. If I have the chance to fish one in June, I will. If not, I've heard they make terrific striped bass flies. Ben the Magog Smelt is a fine pattern. I have used it on the Farmington as well as the West Branch Reservoir with success. Hi Alan...I've seen some of your posts about fishing West Branch Reservoir. That body of water is one of the few around here that actually has smelt, from what I hear. Looks like fun! Very effective fly in my area. This fly produces on all of the Gaspe rivers.